Habit: Annual. Stem: 2--40 cm, strigose, breaking at nodes or not. Leaf: generally alternate, generally 0.5--4 cm, +- linear, strigose to sharp-bristled. Inflorescence: bracted or not; pedicel in fruit generally free from nutlets, generally recurved. Flower: basal cleistogamous flowers generally 0; calyx generally < fruit, lobes free, not arched over 1 nutlet, with hooked or straight prickles, in fruit +- equal or, if unequal, upper 2 > others; corolla funnel-shaped, white, limb 0.5--2.5 mm diam, appendages white or yellow; style attached to receptacle, unbranched, generally persistent, stigma 1, head-like. Fruit: nutlets generally 4, generally paired, often dissimilar in shape, ornamentation, margin width, spreading, 1--4.5 mm, generally compressed, marginal prickles straight or hooked at tip. Species In Genus: 15 species: to British Columbia, Wyoming, Texas, northwestern Mexico; South America. Etymology: (Greek: comb nut, from bristly to dentate nutlet margins of some species) Note: Nutlets of basal, cleistogamous flowers (present in Pectocarya heterocarpa, Pectocarya peninsularis) unusual, not to be used in key. Unabridged Note: Flowers generally of 1 kind with observable white corolla occurring on the cauline inflorescence sections, except for Pectocarya heterocarpa, Pectocarya peninsularis, which also produce cleistogamous flowers, without an observable corolla, that occur at stem bases and produce nutlet shapes not represented in the diagnostic key. Stem: ascending to erect, 2--24 cm. Inflorescence: pedicel in fruit 1--1.5 mm, free from nutlets. Flower: basal cleistogamous flowers present; lower 3 calyx lobes in fruit +- equal. Fruit: nutlets 1.1--2 mm, ovate-elliptic; cauline paired, generally straight, all spreading in 1 plane, margins narrow- to wide-membranous, +- dentate. Chromosomes: 2n=24. Ecology: Washes, roadsides, clearings; Elevation: 30--300 m. Bioregional Distribution: w DSon; Distribution Outside California: Baja California. Flowering Time: Feb--Apr Note: Seldom collected. Basal nutlets 2--4, not paired, reflexed, 1--3 unmargined, others narrowly +- dentate-margined. Citation for this treatment: Ronald B. Kelley 2012, Pectocarya peninsularis, in Jepson Flora Project (eds.) Jepson eFlora, http://ucjeps.berkeley.edu/eflora/eflora_display.php?tid=76582, accessed on April 19, 2019. 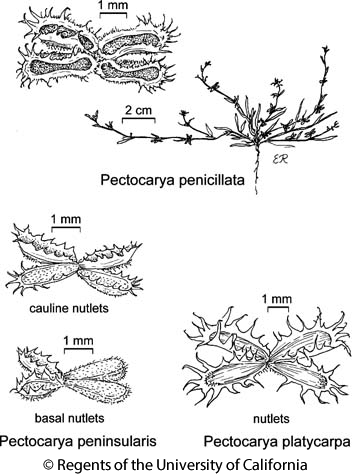 No expert verified images found for Pectocarya peninsularis. w DSon; Markers link to CCH specimen records. Yellow markers indicate records that may provide evidence for eFlora range revision or may have georeferencing or identification issues. Purple markers indicate specimens collected from a garden, greenhouse, or other non-wild location.